Alang Ship Recycling Yard - The largest ship-recycling yard in the world. Located on the western coast of the Gulf of Cambay, Gujarat, India. Hundreds of ships from all over the world find their final resting place in Alang every year. Global Marketing Systems (GMS) - Cash buyers of ships for recycling, demolition, scrap, and breaking. Is There a Decent Way to Break Up Ships? by Paul J. Bailey - ILO Sectoral Activities paper (2000): "By any standards, the demolition of ships is a dirty and dangerous occupation. However, the feasibility of ship-breaking is largely determined by the price of scrap metal. The recent introduction of environmental and safety laws in China - once the major breaking nation - has made this industry unprofitable in that country. The race is to the bottom to find countries where occupational health and safety standards are not enforced." 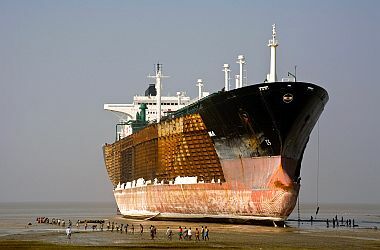 Ship Breaking - Wikipedia backgrounder. Also shipbreaking articles at IMO. Ship Breaking and Recycling Industry in Bangladesh and Pakistan - This report is based on a study commissioned by the World Bank and written in 2009 by a consortium of international and local consultants, headed by Litehauz ApS (Denmark). Dr. Frank Stuer-Lauridsen of Litehauz was the Consortium Leader. Shipbreaking in Bangladesh - Information, resources, international framework, workers rights violations, environmental pollution, benefits from shipbreaking. Worker Safety in the Ship-breaking Industries (.pdf, 70 pp.) - This February 2001 ILO Sectoral Activities issues paper highlights procedures and practices adopted in the disposal of obsolete ships with an emphasis on occupational safety and health (OSH) issues and on environmental aspects as shipbreaking is undertaken today by world-breaking majors on beachheads in Asia. This webpage last updated on Wednesday, January 6, 2016 5:45 PM.